Do your teeth ever make you think twice before smiling? Do you find yourself constantly worrying that people will notice your cracked, stained, chipped, gapped, or crooked teeth? If so, you’re far from alone, and Dr. Whitaker is ready to give you a beautiful, flawless smile using cosmetic dentistry. With the treatments detailed below, she can make any imperfection seemingly disappear, leaving behind a big, bright, and gorgeous set of teeth in its place. With us, the only limit is your imagination, and you can get started today by giving us a call to schedule a consultation. 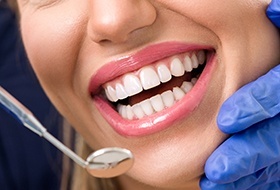 Why Choose Corbin Family Dental Care for Cosmetic Dentistry? 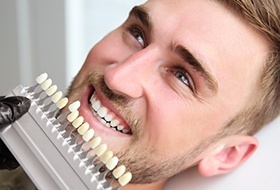 They are extremely thin porcelain shells that are designed to resemble healthy, white enamel, and they fit directly over the teeth to dramatically improve their appearance. They are always custom-made to a patient’s specifications, so you can get just one or an entire set to transform your smile. Metal-free restorations are the perfect marriage of durability and beauty, which is the ideal combination when it comes to dentistry! These crowns, bridges, inlays, and onlays are made of 100% dental porcelain, which is known for its ability to mimic the strength and appearance of natural enamel, even down to how it reflects light. With this material, Dr. Whitaker can create a restoration so lifelike that even a patient will have trouble telling it apart from their natural teeth. Looking for a quick and affordable solution that is guaranteed to improve the appearance of your smile? With direct bonding, Dr. Whitaker can literally sculpt a problem tooth to perfection. She does so by applying a naturally-colored composite resin to a tooth and molding it to look like a regular part of the enamel, hiding any imperfection in the process. The procedure itself is completely painless, only takes about an hour, and can effectively eliminate minor stains, cracks, and gaps. Is your smile looking less than white lately? Want to fix that? With Zoom Whitening, our team can break up even the most stubborn stains to restore that youthful glow to your grin. You can either get a quick treatment in our office or we can provide you with your own take-home kit so you can whiten whenever and wherever you want. 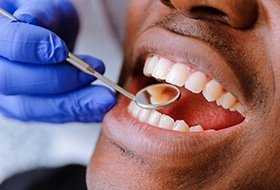 Are your teeth being overshadowed by your gum line? Do your gums make your teeth look too short or stubby for your face? With our soft tissue laser, Dr. Whitaker can quickly give you that perfectly proportioned look you desire. Using the laser’s highly focused beam of light, she can painlessly remove excess gum tissue to unveil beautiful, previously hidden dental structure. She can then shape the gums along the teeth to give your smile the ideal frame.